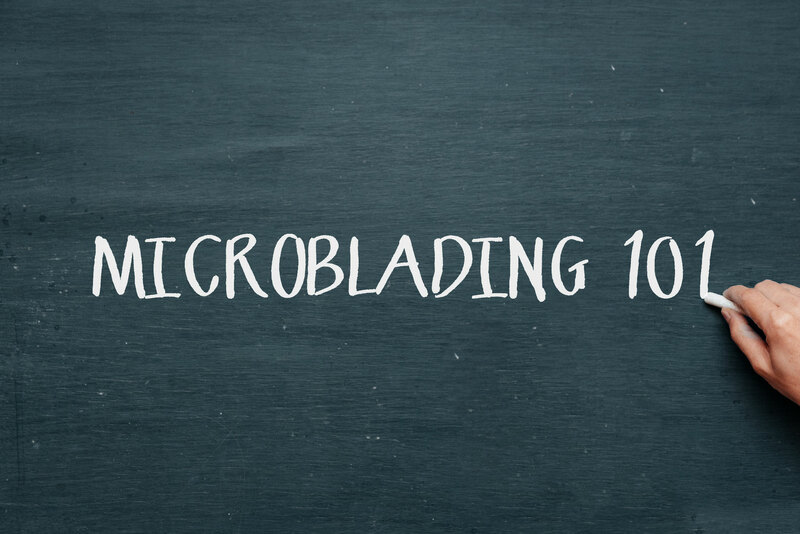 Microblading 101- Are Permanent Cosmetics Tattoos? Yes! Permanent Cosmetics, micropigmentation, dermal implantation, microblading/microstroking, eyebrow embroidery, and long-time/long-lasting makeup, are ALL different names for the same procedure – cosmetic tattooing. Any time color is placed into the skin with any device or hand tool, it is a tattoo process as defined by many well informed regulators, the medical community, and dictionary sources. Denying this process is a tattoo can be problematic for those who would, for religious or other personal reasons, normally refuse to have a tattoo. No! Microblading is done using a hand tool that has a grouping or configuration of needles affixed to a handle to manually create lines that resemble eyebrow hairs. An actual scalpel or cutting-type blade should not be used under any circumstances as these are considered medical devices and cannot legitimately be used for this process. Any hand tool device (i.e., both handle and attached needles) used for microblading should be pre-sterilized and fully disposable. No! Some are promoting microblading or eyebrow embroidery as a semi-permanent process; and that the color only reaches the epidermal (outer) layer of the skin. This is not true. By definition and tattoo industry standards, color is tattooed/implanted into the upper dermal layer of the skin. If pigment particles do not reach the dermal layer, they will disappear during the healing phase of the skin, during normal regeneration of cells at the epidermal level. Pigments do fade in the skin over time, but that does not make the process semi-permanent. It is impossible to predict how much pigment will fade away and how long it will take to do so with any measure of consistency or reliability. Why does Microblading fade faster than eyebrow tattooing techniques done with a device? This is simply because a much smaller amount of pigment is inserted (tattooed) into the skin as compared to tattoos done with a device. Are all people candidates for Microblading? No! Listed below are reasons why people would not be good candidates for Microblading, as their skin may be compromised by many of these. But, some may be a candidate only for procedures done with a device. Has Skin Type 1, 5 or 6 – There are Skin Types, leveled 1- 6. Type 1, which is very fair, translucent skin, will not be able to tolerate microblading well or retain color. Type 5 or 6, darker skin, would require more pigment in the skin, therefore having it done with a device would be better. Has oily skin, loose skin, large pores or acne on forehead. Has previous permanent cosmetics – Because of the lack of contrast due to previous tattooing, microbladed stroked may not show. In addition, if the previous tattoo has faded to undescribable undertones, these tones would show through between the new strokes. A shading technique or possibly even removal may be necessary. On medications for Chronic Acne, Blood-pressure, Cancer. Brow/Lash growth serums such as Latisse can also be a problem. Is Microblading a good technique for people with no brow hair? It will look more natural if there’s some brow hair. Microblading, along with some shading done with a device will give someone with no hair a more natural look. Do you need a license or certificate to practice Microblading? Yes! It depends on the State or Country in which you practice. For example, in California USA, only a certificate is required. Research your local and federal laws in your area. It is highly important you follow the strict guidelines enforced by some states and their health agencies. What is the average price range for a QUALITY Microblading procedure? It ranges from $400 – $1,500.00, due to demographics and the experience of the technician. Other than basic Microblading techniques, what other subjects should a good Microblading Technician be educated in? Sanitation, sterilization, bloodborne pathogens, proper after-care, color theory, skin types, skin diseases and the skin healing process. Is an Esthetician’s or a Cosmetologist’s license sufficient enough to practice Microblading? No! Although Estheticians are highly educated in the skin layers and types, they do not typically break the skin during procedures and Color Theory is not part of their education. The opposite is true for Cosmetologist’s. They are educated in Color Theory, but do not have any background in skin. Should a potential Microblading student inquire about the education of the Instructor? Why? Should they see the facility before they enroll? Absolutely! Many Instructors today have only taken one 1-2 day class, and they are training others. Look for a school that has a good reputation. The student must do their research and choose a school that has many quality technicians as alumni. The facility where the training will be done should be a clean environment. A room in a home or a hotel room are not proper facilities, and may be against the law in some areas. What is an acceptable ratio of students to Instructors when searching for Microblading classes? During the classwork and practice portions of a class, the ratio should be around 3-4 students to 1 Instructor. During the live procedure portion where you will be working on live models, the ratio should be 1 student to 1 Instructor at a time. One on one attention is crucial! Why is it essential for students to practice on a live model during training (under the direction on an Instructor)? Basically, it’s the only way to really learn. Working on actual skin is completely different than the best pig skin, fake skin or foam pad or tape you can get. There are so many different variables. Working on a live model during training, doing an actual procedure, also helps boost confidence when heading out on your own to work on clients. Why is the SPCP (spcp.org) a reliable source to find a practicing technician for a procedure? They require higher educational standards, follow a strict code of ethics and give the public access to experts and reliable information. How do you know you’ve chosen a good technician for a Microblading procedure? The technician should hold a 100 hour certification in a beginning fundamental course. (The more hours of training, the more skilled and educated your technician will be) They should also have the proper health permits for their area and a bloodborne pathogen certification. Is there a procedure done with a tattoo device that mimics the same fine hair strokes that you see in Microblading? Yes! The newest digital devices, and some rotary machines, now have very fine needles available to do fine, detailed hair-strokes that heal to look like Microblading. An experienced technician, together with a fine Nano needle, can do a hair stroke procedure and give you that Microblading look you want. And…..it lasts longer, as there is more color inserted into the skin. Be sure to find an experienced technician….if too much pigment is implanted or if the pigment is implanted too deep, the hair strokes will blur. Are the Microblading hand-tool needles safer than the needles used on a digital or rotary tattoo device? They are BOTH safe if used properly. Most technicians use pre-sterile, disposable hand tools and needles. There are some technicians that sterilize their own equipment, just be sure they have the proper autoclave equipment. If it is a reputable facility or technician, they will be happy to prove to you that their equipment is sterile and the autoclave equipment is in proper working order. An autoclave is a machine that uses high-pressure steam to kill any bacteria or micro-organisms on the equipment’s surface. Why should a Microblading technician be completely certified in Permanent Cosmetics? There is so much more to a procedure than dragging a Microblading hand tool through skin! Skills in color theory and choice, appropriate skin type, skin conditions and diseases, healing procedures and complications are all part of the process. If a technician is not certified in Permanent Cosmetics, you take a chance that they were not trained in any of the skills listed above. Also, not everyone is a candidate for Microblading, so having the Permanent Cosmetics certification allows them to offer a procedure with a tattoo device instead. There are many procedures that can be done with a tattoo device, such as Eyeliner and Lips. It is NOT recommended to have these procedures done with a Microblading hand tool. Should a Microblading technician have a current Bloodborne Pathogen certification? Yes! They are working under the skin with blood and tissue. If someone is trained in Microblading, is it acceptable for them to teach it to others? It depends! It takes time and hundreds (even thousands) of procedures to perfect a skill. Be sure the trainer has both Permanent Cosmetic and Microblading certifications, has many years of experience, a great track record, good reviews and can offer several referrals from past trainees and models or clients.